The 8′ x 5’6 Shire Loft Playhouse would be a dream place to call their own for any child. 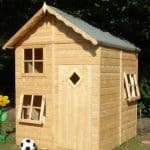 The playhouse offers a fantastic look that makes it resemble a real house, lots of space for them to play and store their toys and also for them to have friends over. In general this really does have just a whole lot of charm. This playhouse will be something that the kids will enjoy telling their own kids about many years from now. 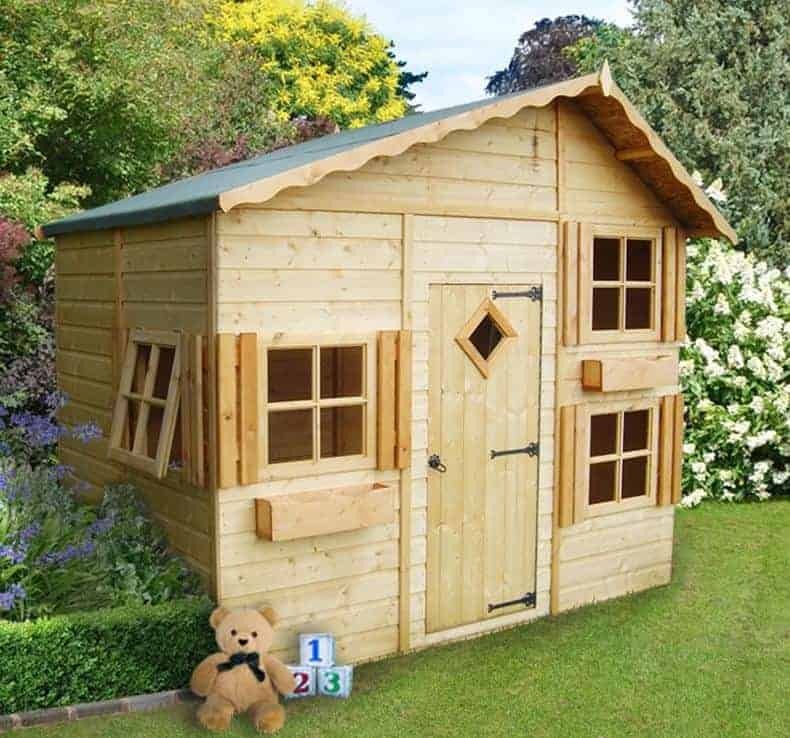 With both a nice sized down stairs and an upstairs that can be reached with a ladder, four windows, a lovely door and a well-crafted design this has everything that a child could want from a playhouse. The great looks of the Shire Loft Playhouse are backed up by the most high quality of materials. Tongue and groove cladding and a felt covered apex roof will keep all the water out. And the flooring that is used in here will make it so the kids can have a wild time and be able to store as many things as they want inside. 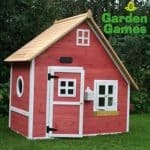 With two windows that open and two that have their own little window box the windows are one of the main features of this fantastic playhouse. Kids may want to move in! 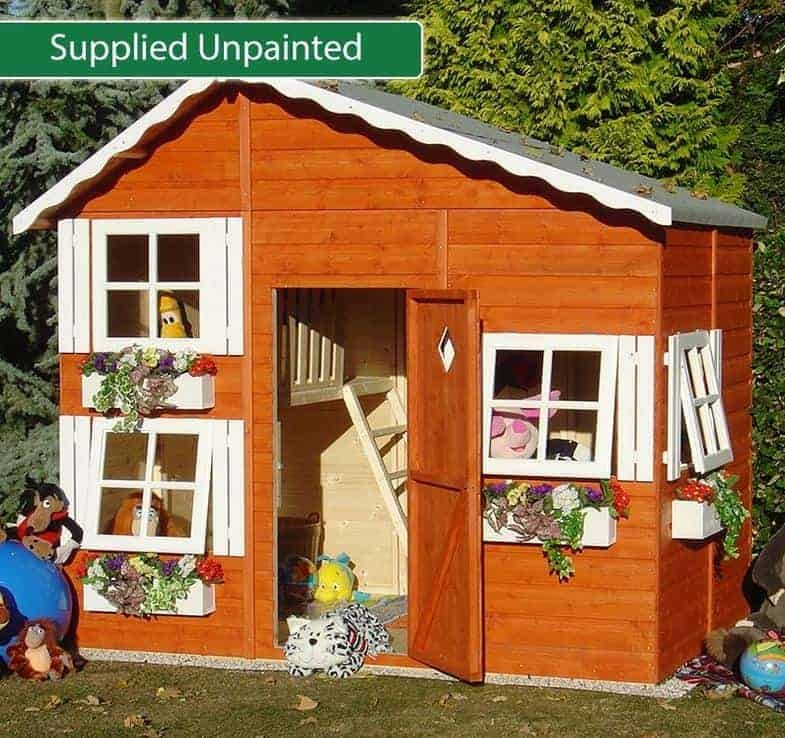 Here we have a great way to get your kids or grandkids on the property ladder! 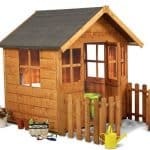 This is one of the most charming and incredible child’s playhouses that you will ever set your eyes on. 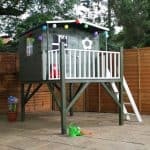 This is a multi story playhouse and as a result it has a real presence in your garden, but this means the kids have a lot of space to play with inside. From bottom to top the 8′ x 5’6 Shire Loft Playhouse is 7 feet 7 inches high. This may sound higher than normal, but like we said this is multi story and inside there is a lovely little ladder which the kids can use to get to the higher level. The width of the playhouse is 7 feet 10 inches and the depth is 5 feet 9 inches. The kids are going to have the time of their lives in here and they have a lot of space to make it happen. As well as offering a place for kids to have fun, parents can rest assured that this has passed every child safety test it was put through. We honestly do not think there is a single person out there who will not love the way this playhouse looks. The roof has been done in a very interesting way it is an apex style roof, but the two sides are slightly different lengths giving the roof a very cool look. 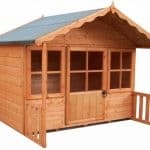 The roof is made from high quality 11 mm thick boarding. The felt used is top quality and will protect the wood very well and the apex design will ensure no rain gets in or sits on top slowly soaking in. From the first look, you can tell right away that the cladding here is made to last. This is 12 mm tongue and groove cladding which is made from some high quality timber to ensure the walls are strong as can be. The cladding that has been used here has been picked because it not only looks good, but because it will also be able to take the abuse that the kids will give it over the years. Shire know that kids can cause a lot of damage so they have made sure to put one very strong frame in this playhouse. The frame is made from some very fine timber and at 35 mm x 35 mm the frame will be able to take all the kids can throw at it. This frame will be responsible for this playhouse still standing strong after many years of use. The flooring which Shire have used really did surprise us. We are used to sheds and playhouses using the same boarding for the floor as the roof, but that is not the case here. The flooring is actually 12 mm tongue and groove boarding which is very similar to what the walls are made with. This flooring makes it possible to put all kinds of things inside ranging from just loads of toys to furniture to really make this feel like a little house. Before it is delivered the playhouse will be dip treated, but to really make this be something the kids can enjoy for many years, you are going to have to give the whole playhouse a coating of wood treatment. This to be honest should not take you too long and if you do it once a year the playhouse will be with you in top condition for lots of years. Shire give you a one year warranty which is very handy to have and something we feel is very fair. We really love the door which Shire have used here. It looks every bit as good as the rest of the playhouse. It is a single door, but a good size at, just under 2 feet wide making it easy for the kids to get in and out and bring a whole lot of stuff inside. The door has a classy little window as well as this there are black hinges and a black door handle for easy access. The windows on here are just incredible and one of the best features of the playhouse. There are four windows and they all have these mock shutters to give them a little bit more style. Each window has a cross design to it and is fitted with high quality shatter proof styrene. Two of the windows actually open to let in a little bit of fresh it, Shire have made sure that these windows do not open so far that the kids can climb in and out of them and we love that attention to detail. The other two windows have these charming little window boxes underneath them. The door and windows do securely shut, but there is no locking mechanism included. To tell the truth we feel that this should be a place the kids can walk in and out of freely and feel a lock on the door would cause nothing but hassle. With four windows this is not the most private of playhouses, but we doubt your kids will care. They will want everyone to be able to see their own home and if they do get sick of people peeking in their windows then you can always take them shopping for some curtains. 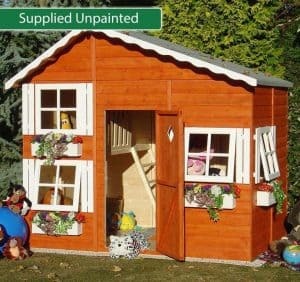 This is a great looking playhouse, but you can change the colour with some coloured wood treatment. Another way to add a little more colour to the playhouse is by making use of those window boxes and letting the kids put in some plants. Even some artificial plants we feel would look nice. The playhouse comes with two window boxes as standard, but you can by another two if you so wish. You do not even have to touch it to feel how strong it is to know that this is a high quality playhouse. From the first look, you know this is something that is top quality from top to bottom. 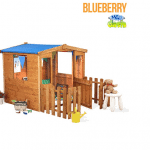 Shire have made this playhouse knowing just what kids are like and that is why we feel this is going to last many years as it has been built with strong and long lasting materials. With both an up and down stairs the kids will have all the room they could possible need inside here. Just from looking at the pictures, you know this is going to take some work putting together. Just be sure to have a friend or two helping as this at the very least is a two person job. It may take a while, but the instructions are easy enough to follow and the look on the kids’ faces is well worth the effort it takes. This may not be the cheapest child’s playhouse out there, but it is certainly one of the most impressive. We are sure that your kids will enjoy playing with this until they are too big to fit through the door and even then they will have many years of memories to look back on. Final Thoughts: We feel that the 8' x 5'6 Shire Loft Playhouse is just incredible in pretty much every regard. From the quality of the materials used to the overall design. This is what a kid dreams of having and we think that it will give you just as much joy to watch them playing in it as they get from playing with it. The price may be slightly up there, but we feel for the quality you are getting and the fun that it is going to bring it is more than worth it. If you want to really treat the kids and give them something they will remember forever then you will find it hard to top this.